Environmental Expressive Therapies contributes to the emerging phenomenon of eco-arts therapy by highlighting the work that international expressive arts therapists have accomplished to establish a framework for incorporating nature as a partner in creative/expressive arts therapy practices. Each of the contributors explores a particular specialization and outlines the implementation of multi-professional and multi-modal "earth-based" creative/expressive interventions that practitioners can use in their daily work with patients with various clinical needs. Different forms of creative/expressive practices-such as creative writing, play therapy techniques, visual arts, expressive music, dramatic performances, and their combinations with wilderness and animal-assisted therapy-are included in order to maximize the spectrum of treatment options. Environmental Expressive Therapies represents a variety of practical approaches and tools for therapists to use to achieve multiple treatment goals and promote sustainable lifestyles for individuals, families, and communities. 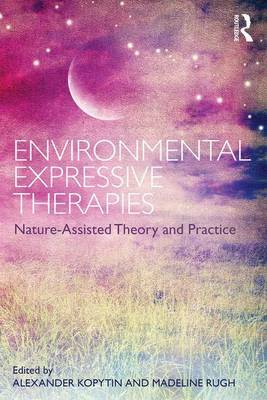 "This thought-provoking book is a rallying cry for the integration of nature-based practices and expressive arts therapies. Collectively, the authors provide a theoretical, philosophical, research, and practical foundation for creative therapists interested in the intersection of individual and environmental recovery." "Kopytin and Rugh bring together a thoughtful compilation of materials that challenge expressive therapists to expand their philosophies and practices to incorporate humankind's essential relationship with nature. In each chapter, poignant vignettes and case examples richly illuminate the authors' environmentally conscious therapeutic strategies so that approaches can be readily understood by readers. Upon completion of Environmental Expressive Therapies, readers will have a deeper understanding of how nature-based strategies may enhance and support clients' well-being." "Scientifically, without using stories, the life of Nature's unified field loves to create its self-correcting time and space, moment by moment, which includes us. In any natural area our 54 senses love to blend into Nature's perfection and this reduces our disorders and nature-injurious ways. The information in Environmental Expressive Therapies tends to affirm this process. It supports our 54 senses and sensibilities, integrating Nature's love, balance and beauty and we benefitting as Nature reasonably transforms us."